Eating meatballs marinara is something of an affair for me. In recent months, I've been cooking them about once a week because they are absolutely delicious. I can eat the meatballs straight out of the pot without anything else to accompany them, but give me a bowl of pasta or even some plain rice, and I can have a fantastic dinner. Over the years I've had long discussions with aunt Marg and my mother-in-law as to how they like to make their meatballs. After telling them step by step how I make mine, they both agree that it is, indeed, their way. Mind you, Aunt Marg and my mother-in-law have been making spaghetti & meatballs for decades now, so it’s nice to know that I make them in the same manner. Beef or a mix of ground beef & ground pork and/or veal is common if you like making them with those types of meats. At home, however, I make mine out of ground turkey. Dark meat or a mix of dark & light is preferable to light turkey meat because it is more succulent and flavorful. What goes into the meatballs is typical (I don’t add onion to mine) of what you’d find in most recipes and browning them in delicious olive oil before putting them into the marinara is essential for me. Some cooks will just drop them into the bubbling sauce (or gravy, as some would say) without browning them first, which is completely fine, but I like to give them even more flavor. The marinara is equally important and it’s not something which should be thought of as time consuming. You only need a few ingredients to make a rich marinara and with the addition of the meatballs, you will have a sauce that is thick & rich when it’s done. Worthy of any pasta to be sure. A weekday dinner or weekend lunch in under an hour is what this dish is all about. Check your pantry and refrigerator for the ingredients and make some this week. There won’t be any left, I guarantee it. Note: I like a spicy marinara (arrabiata) so I add a 1/2 teaspoon red pepper flakes, but you can omit it entirely if you wish. Something I learned a long time ago by cookbook author, Susan Spungen, is that you should remove the inner sprout of the garlic cloves should you find any. This is typical of older garlic. Those sprouts are bitter and you do not want them going into your marinara. Slice each clove in half and remove the sprouts with the tip of a paring knife. In a large dutch oven or sauce pan over medium heat, add the extra virgin olive oil and red pepper flakes. Get the oil hot! Add the halved garlic & dried basil (if using) and sauté for 1-2 minutes; don’t let the garlic burn. While this is sautéing, crush the whole peeled tomatoes with your hands so that you have a chunky tomato sauce. Add the crushed tomatoes to the pot and bring it up to a simmer over medium-high heat; stir well. Salt generously and add freshly ground pepper to taste. When it does come up to a simmer, lower the heat to low and cover the pot with a lid. I like to let this simmer for about 20 minutes while I'm making the meatballs. Note: I love the sharp taste of Pecorino Romano in my meatballs, but you can use Parmigiano-Reggiano instead if you prefer it. In a large bowl, add all of your ingredients. Salt well (I add 1 teaspoon of fine sea salt) and pepper to taste. Mix the ingredients well to distribute them evenly. Using a 1 1/2" (1 oz) ice cream scoop, portion out the meatballs and roll them into balls. I use gloved hands to do this, but if you use bare hands, simply keep them damp so that they don't stick to your palms. Place the meatballs onto a platter or plate as you go along. The yield will vary slightly if you have a little more than 1 lb. of turkey or a little less. [A.] In a large nonstick frying pan (I'm using a 12" one) over medium heat, add about 2-3 tablespoons of olive oil to cover the pan and add about half of the meatballs--don't crowd them. Brown them evenly. [B.] Flip the meatballs when they get well browned on one side and continue to give them a nice color. Meatballs tend to flatten somewhat, so I brown them on 2 sides. 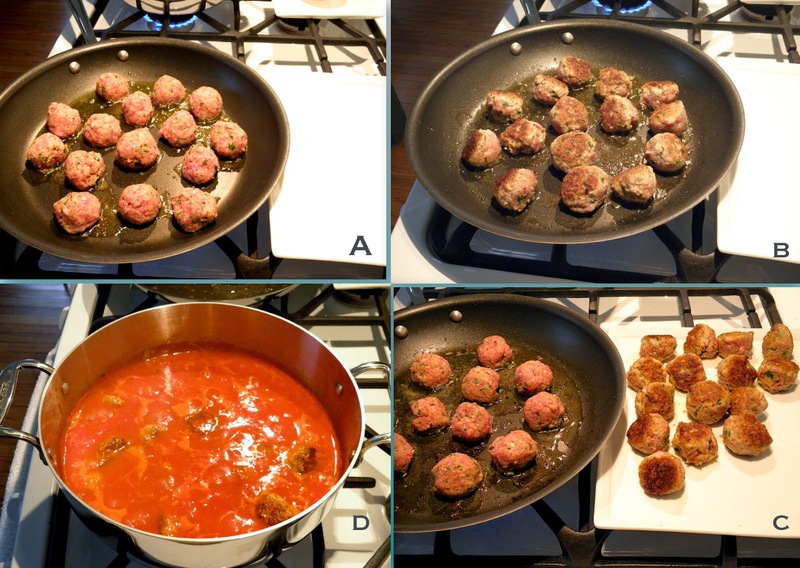 [C.] When browned, remove the meatballs onto a clean plate or platter and continue with the ones remaining. [D.] Once they have all browned, add them to the bubbling marinara. Carefully drop them in and stir them gently with a wooden spoon. Make sure you cover them well with the marinara. Lower heat and place the lid on the pot. Simmer the meatballs and marinara for 20 to 30 minutes. The sauce will thicken considerably and the meatballs will be cooked through and very tender. Boil your favorite pasta as these are cooking and bring it all to the table. Make sure there is plenty of freshly grated cheese to pass around. Pour the wine and mangia! Straight out of the marinara, it doesn't get better than this! Meatballs marinara can be made ahead of time and frozen for up to a month in an airtight container. If you wish, you can even cut the recipe in half for less servings, but why would you want to if you have a future meal already prepared? I serve these meatballs with a good spaghetti, but they're also tasty with linguine or some rigatoni. It's up to you, but you know, the little savories can also be stuffed into a roll to make a meatball hoagie. Just heat up the bread and add some provolone or fontina to the sandwich (let it melt), and you have a great sandwich. Treat your family to some healthy meatballs marinara this week. Absolutely delicious!